Software Solutions – Ativa Interactive Corp. Spend less time managing your software and more time engaging your clients and prospects. 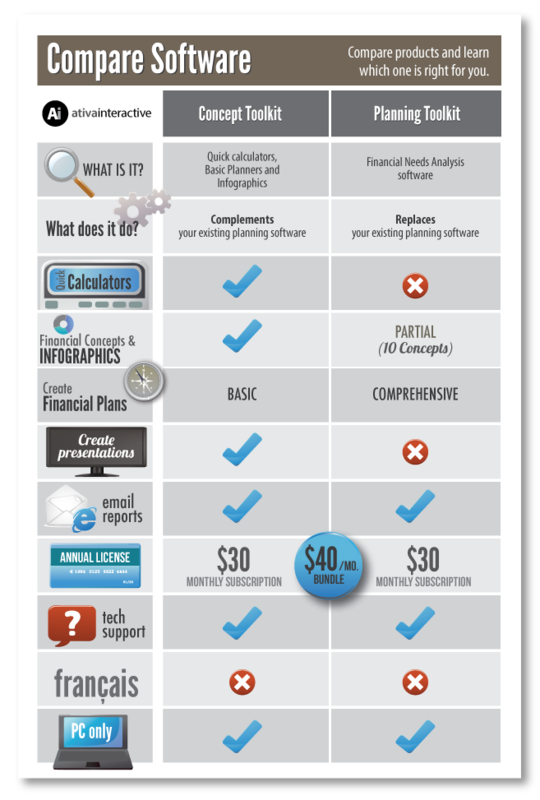 Concept Toolkit includes over 100 calculators and 200 infographics to provide advisors with the perfect software tool to complement their existing needs analysis software. Planning Toolkit includes ten integrated modules allowing advisors to complete a full financial plan in 30 minutes. It’s modular and flexible enough for a single needs analysis when a full plan is not needed. Advisor Profiles is a one-page Value Profile Statement that illustrates the services and value Advisors provide to clients. As the new CRM2 statements are being delivered, it’s a great tool to help clients understand more about fees and the valued services they are receiving. Ativa Interactive develops easy-to-use financial planning software, website content and calculators, and infographics for financial advisors, institutions and other professionals. Operating on the premise that professionals shouldn’t have to be technology experts, Ativa software is both powerful and intuitive so Advisors can spend less time learning software and more time with their clients. Both Concept Toolkit and Planning Toolkit are designed to support financial service professionals by providing convenient tools to help them analyze, explain and offer historical context to reinforce their recommendations. Our software is sold on an annual subscription basis. There is a minimum subscription period of 12 months and you can pay for your subscription on a monthly basis or with an annual payment. * Applicable taxes (GST/HST) are extra. * For multiple user pricing, contact us at email or 905-648-3221. NOTE: Ativa Interactive Corp. has a No Refund Policy on all of our software applications and bundles. We offer free, fully functional trial versions of our software that you can download and try before you buy. These trial versions allow you to test the software before you decide to make a purchase. The only limitation in the trial copy is the use of a fictional advisor name instead of your name.